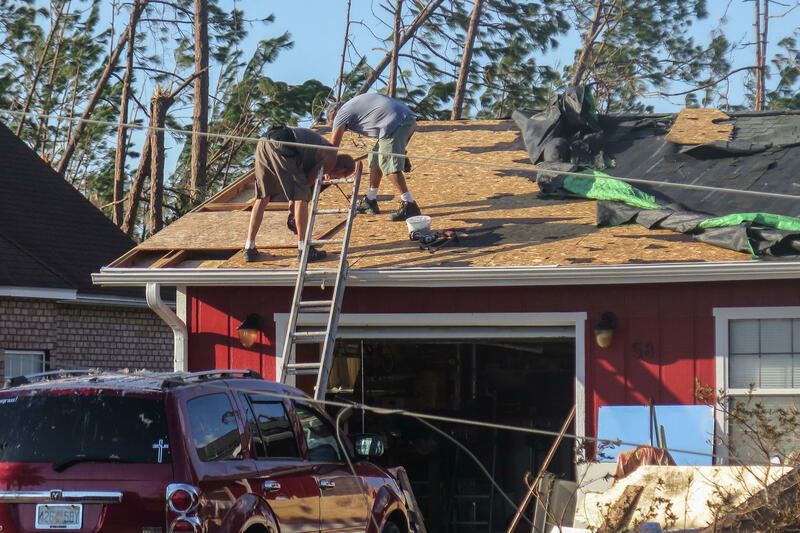 Lance Erwin works with a neighbor in Mexico Beach, Fla., to repair parts of his roof after it was blown off by Hurricane Michael. Rules are looser in the Pandhandle, allowing construction that couldn't stand up to the storm's 155 mph winds. 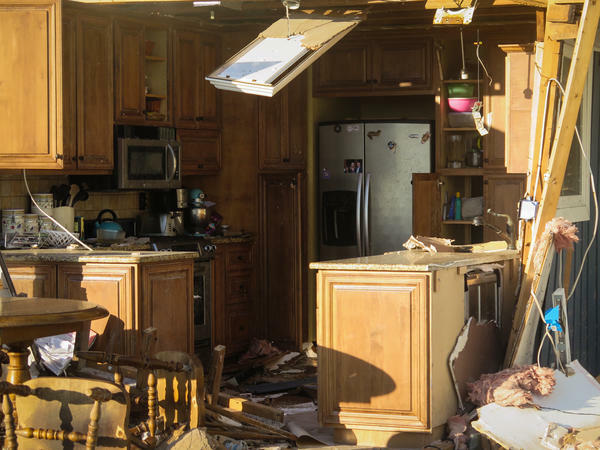 The kitchen of a severely damaged home in Mexico Beach after Hurricane Michael. The state of Florida has some of the nation's toughest building codes - at least most of the state. The rules are less stringent in the panhandle. That's where Mexico Beach is, and that's where Hurricane Michael made landfall with 155-mile-an-hour winds a week ago. Entire blocks were flattened. NPR's Greg Allen reports many are now calling for revised stricter building codes on Florida's Panhandle. GREG ALLEN, BYLINE: In Mexico Beach, Lance Erwin is one of the lucky ones. His house is still standing. He rode out the storm in his home several blocks from the beach. LANCE ERWIN: The garage door was shaking. It was like somebody was trying to get in, and the inside door was shaking. I knew the roof had gone at that point because everything was shaking. I thought just hang in there and I had faith everything was going to be OK.
ALLEN: Erwin lost doors, windows, part of his roof, but his home is largely intact. The same can't be said for many other residents. Mexico Beach's mayor says 75 percent of the town is gone. The storm surge washed houses on the beach off their foundations to the other side of the coastal road. High winds lifted off roofs and knocked down walls. Craig Fugate is the former head of FEMA and a longtime emergency management official in Florida. He points to one reason for the extreme destruction in Mexico Beach and other communities on the panhandle. In many cases, it's old construction that predates the building code. CRAIG FUGATE: I mean, this is a part of Florida that's what I call the Old Florida. It's not a bunch of high-rises. It's not a lot of new construction. This is multigenerational Florida families. Many of them were descendants from folks that fished the areas. ALLEN: After Hurricane Andrew in 1992, Florida took a hard look at its building codes. In South Florida, Miami-Dade and Broward Counties adopted strict standards requiring storm shutters and reinforced concrete block construction for all buildings. Structures must be able to withstand winds up to 175 miles per hour. Several years later, Florida revised its statewide building code. John Pistorino, a structural engineer in Miami, says officials decided not to require South Florida's 175-mile-per-hour wind speed standard throughout the state. JOHN PISTORINO: Unfortunately because it is based on probability of storms in the past and all of that, it sort of goes down as you go further north in Florida. ALLEN: Historically, there have been fewer intense hurricanes on the panhandle than elsewhere in the state. In some North Florida communities, new construction need only withstand wind speeds 130 miles per hour or less - far below the 155-mile-per-hour winds seen in Hurricane Michael. In the aftermath of the storm, as local, state and federal officials assess the damage, a consensus is emerging that building codes along Florida's Panhandle need to be stricter. David Prevatt is a professor of civil engineering at the University of Florida. He's part of a team that spent the weekend on the panhandle gathering data on Michael's impact. DAVID PREVATT: What we saw there was damage to pretty much all types of construction, all types of materials and all types of housing. What was not damaged were houses that were well-engineered. ALLEN: Former FEMA head Craig Fugate has long believed that the wind speed standards along Florida's Panhandle were too low. He says when policymakers developed them, they left out information about a powerful hurricane that hit the area in the 19th century before accurate record keeping. FUGATE: And if you add that storm back in, and now particularly if you add Michael back in, it’s going to force a much higher wind load requirement for the coast well inland based upon those two storms. ALLEN: Florida's building commission is now in the process of revising the state code and is awaiting recommendations from the University of Florida team led by David Prevatt. But Prevatt says understanding how to build resilient structures is just the first step. PREVATT: We know what can be done. It has been proven. The research is there. It is whether a community is willing to adopt it or not. 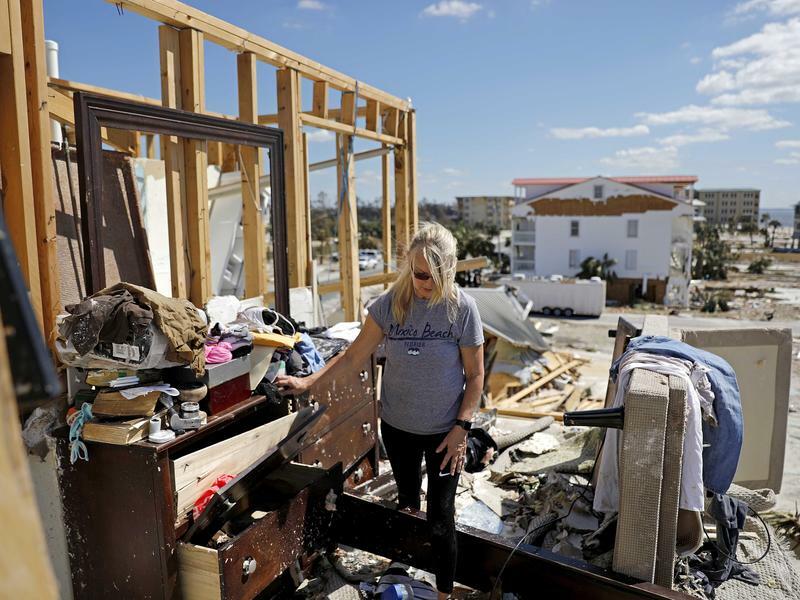 ALLEN: Realtors, homebuilders, the insurance industry and many others will all have a voice as Florida considers how to prepare the panhandle for the next storm like Hurricane Michael. Greg Allen, NPR News. Transcript provided by NPR, Copyright NPR. In the days leading up to Hurricane Michael’s landfall, Gov. Rick Scott did what any Florida governor would do: warn people. After the storm passed, Scott shifted from warnings to gravitas. But his appearances were more significant than previous storm responses (Michael is the fourth hurricane Scott has had to respond to in his eight years as governor). With elections just under three weeks away in Florida, candidates – especially those for governor and U.S. Senate – know that voters could cast their ballots based on how candidates responded to the storm. Florida residents still trying to piece together their lives in the aftermath of Hurricane Michael are missing one much needed tool: reliable cellphone service. Amid reports of ongoing and widespread outages, the chairman of the Federal Communications Commission, Ajit Pai, is calling for an investigation of the problem. He is also calling for wireless carriers to waive October bills of Florida customers in areas hit by the hurricane. People in the Florida Panhandle desperately need help — in the form of cash, food and cleaning supplies — after Hurricane Michael smashed ashore as a catastrophic Category 4 hurricane. Here's how you can help from South Florida, and avoid the scams that inevitably arise after natural disasters.